Last Halloween, I bought a Peter Pan costume for G at a consignment shop. I realized that it was much too large, so I set it aside for this year. Coincidentally, my mother-in-law gave G a Peter Pan book about a month ago, and someone’s been all about Peter Pan, Captain Hook, and Tinkerbell since then — perfect timing. The green tights that came with the costume were still far too large, so we completed the look with some green socks and a pair of borrowed, green-striped pajama pants. I made a sword using cardboard and tape (duct and electrical). And then, two weeks ago, it occurred to me that our Halloween’s where G wants to be something cute and cuddly were numbered (he’d been enjoying pretending to be a baby cat), and I asked if he would like to be a cat (thinking we could use black clothing we already owned and make a pretty simple cat tail and cat-ear headband). Gabriel decided he wanted to be BOTH a cat and Peter Pan. 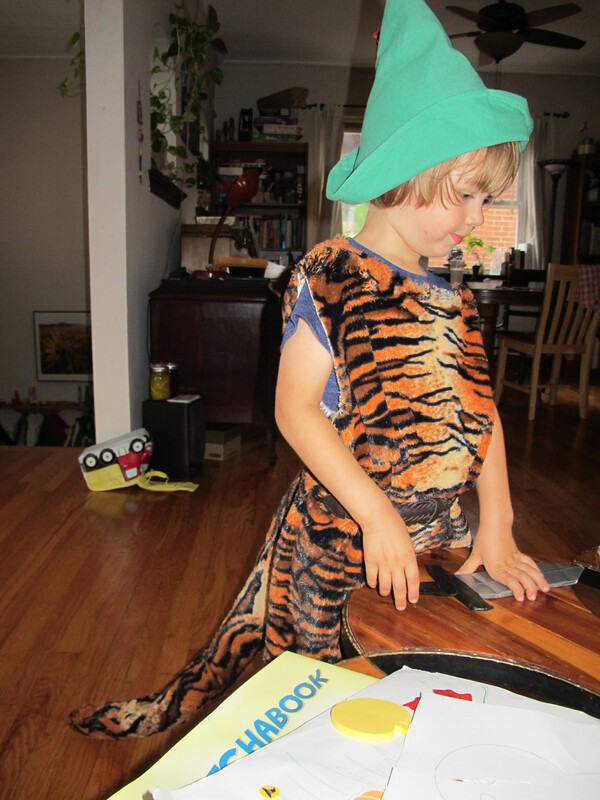 Somehow, word of the cat idea got to my MIL, which led to a trip to the fabric store and ended with homemade tiger costumes (for both Gabriel and Matthew). For the last week, Gabriel has thoroughly enjoyed dressing up as one or the other. He likes snuggling up with Daddy Tiger and a book, and he rarely goes anywhere without his Peter Pan hat and sword. Here’s a Peter Pan-tiger fusion costume. I’m not sure which one he’ll decide on for Trick or Treat. Fortunately, either costume option can be made warmer by wearing either black (tiger) or green (Peter Pan) layers under the tunic-style tops. 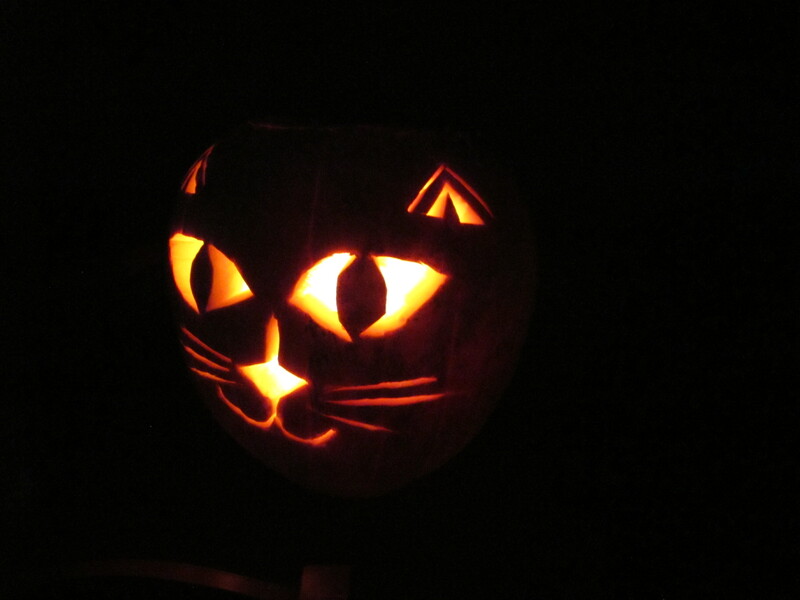 We carved one pumpkin on Sunday morning and another on Wednesday night. 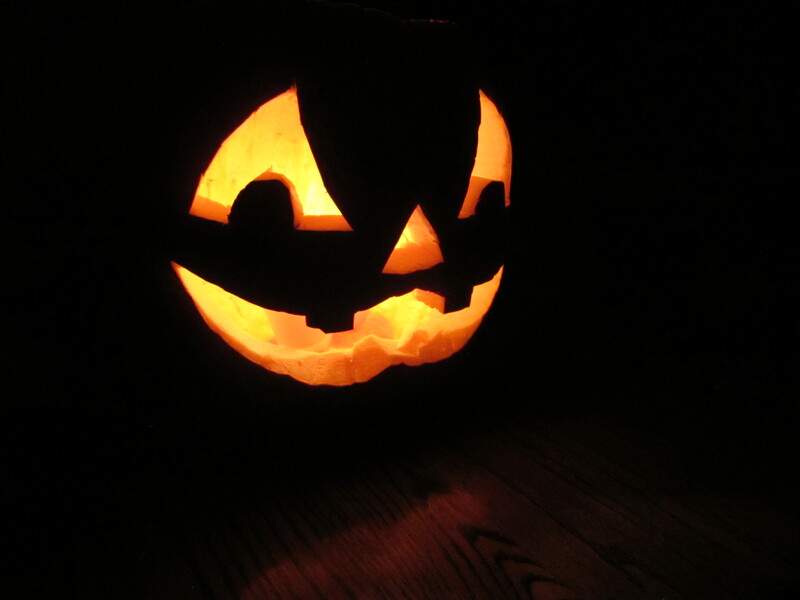 We used a rather traditional jack o’ lantern design for the first pumpkin. While Matthew was mostly correct in his comment about not getting to eat the pumpkin, I did cook up the chunks that we cut out while carving this guy. Not the best winter squash ever, but not bad: mildly sweet and not bitter. We’ll be having pumpkin soup with our dinner tonight. Sadly, the seeds, which I was looking forward to, were a bust. I did my normal roasting technique, but the roasted pumpkin seeds tasted like crunchy cardboard. Matthew suspects that the farmers may have cut the pumpkins off the vines early, before the seeds were totally mature — bummer! 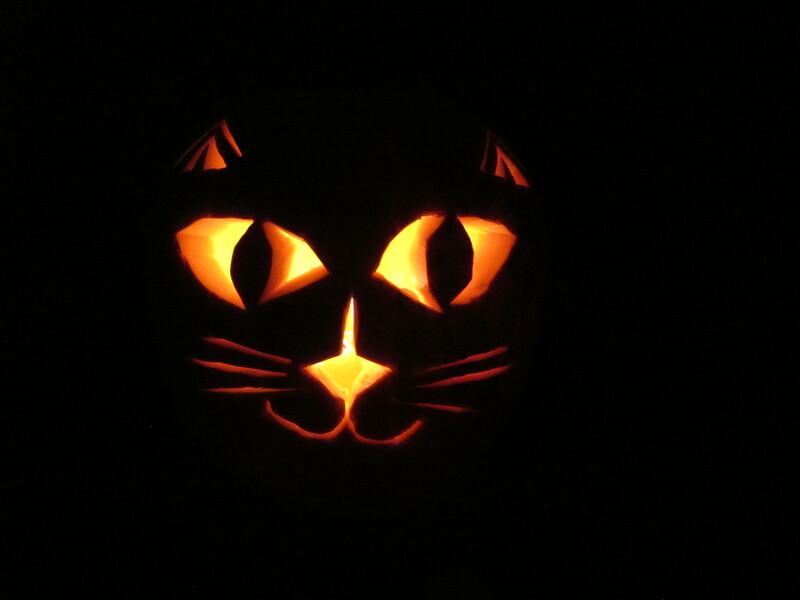 For our second pumpkin, I suggested a cat face. We looked at some images online for inspiration, and then Matthew drew and carved this beauty. This entry was posted in My Life and tagged halloween, holidays. Bookmark the permalink.